The Hero Award for Excellence commends UC San Diego faculty, staff and students for their acts of courage and bravery. Environment, Health & Safety (EH&S) believes that employees who protect life, property and the environment should be recognized for their emergency response effort. In 2017, she saved a life using CPR and an AED. 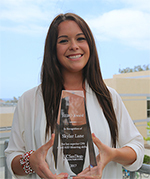 On Tuesday, May 9, 2017 the 1st annual, "Hero Award for Excellence," was presented to Skylar Lane, UCSD senior, at the Global Health and Climate Change Conference: The Health Risks of a Changing Climate. The award was presented by Daniel Gough, Director of EH&S.